The City of Lights is a gourmet playground for food-lovers everywhere. From croissants and coffee to picnics and wine bars, these are our Paris foodie experiences you simply cannot miss. Paris might be the city of love, but it's also the city that loves food - and that we love to eat in! There really are very few cities in the world that are better for eating than Paris, from Michelin-starred restaurants to Boulangeries bursting with delectable sweet treats. But all that deliciousness can be a little overwhelming when you’re trying to work out exactly what to eat and where to eat it - especially on a hungry tummy! We’ve put together a list of our favourite Paris foodie experiences you can't miss, so once you've enjoyed everything to see and do in Paris, you can concentrate on the most important part: eating all the noms. Bon Appetit! That sounds more like a tongue twister than a favourite Parisian pastime, but don’t underestimate how important the cafe culture here in the French capital really is. On any street, on any morning, the round outdoor tables of Paris’ cafes are bustling with people beginning their days the right way: with a flakey, buttery croissant and a steaming cup of espresso. Surrounded by an eclectic crowd - businesspeople chatting as they broker deals, friends catching up before going on with their day, or those who are lost in the day’s paper or scribbling in their notebooks - this is the perfect spot to soak up the atmosphere. The key is to take your time and enjoy the moment; relaxing and slowly sipping a drink is one of the greatest common pleasures in this city. Parisians love of cafes goes way beyond a love of coffee too; for centuries the greatest artists, writers, and philosophers have met at these cafes to discuss and debate, and some of the world’s greatest fiction has been scribbled down at these tables. A few years ago, we received some of the best travel advice we’ve ever been given: if you ever find a group of locals queueing, join that queue without hesitation. The reasoning is that locals know where the good stuff’s at; if there’s a queue stretching to the street and beyond, you can be sure that whatever is waiting on the other end is something you want to try. Nowhere is this rule truer than for queues outside Parisian Boulangeries in the morning. After all, there's probably nothing more quintessentially french than a baguette, and a fresh baguette, still warm from the oven with a perfect crackling crust, is worth queueing up with the rest of Paris at a favourite local Boulangerie for in the morning. Au Petit Versailles du Marais - this intricately decorated Boulangerie from the 1860s is worth visiting for the interior decoration alone! They also won second-best Baguette in Paris in 2014, and take it from us, they are GOOD. Also, their tarte aux framboises (raspberry tart) is to DIE for, check the image below! With rich lashings of butter and cream, french cuisine typically doesn’t lend itself well to street food. But there is one extremely delicious exception in the humble French crêpe. Thin, delicious, and with savoury or sweet fillings to suit any taste, this traditional French pancake from Brittany is definitely a must-eat item in Paris. Sweet-toothed travellers are spoiled for choice, from oozy Nutella to fruit and sugar or marmalade fillings, while savoury crêpes stuffed with vegetables, meat, or fromage (or all three!) will satisfy those who prefer their meals without a sugar rush. They’re also cheap and can be eaten on the go, which means it’s the perfect snack to keep you fuelled for the rest of the day’s sightseeing or gallery-hopping. For the best crêpe experience, always go to a proper Crêperie, avoid places that have stacks of pancakes sitting already cooked (trust us, you deserve a fresh one! ), and we’ve found the general rule is if the Crêperie looks a bit rustic and pokey, you’re likely onto a winner! La Droguerie du Marais on Rue des Rosiers; we’ve never seen this place without a queue, and heck, these crêpes are delicious! Of all of France’s pastries, it’s definitely the classic macaron, that melt-in-the-mouth almond meringue sandwich with delicately crispy shell and gooey ganache filling, that takes the title as most popular. Admittedly, we’ve both scoffed more than our fair share of macarons around the world - but none have ever come close to rivalling the ones in Paris. We’re actually trying not to drool right now just thinking about those deliciously sweet little pastel bursts of flavour! Most people will tell you there’s a fierce macaron competition being waged on the streets of Paris at the moment too, between the houses of Laduree and Pierre Herme. To be honest, we’ve never been able to draw a winner; Laduree originally invented the macaron, and their focus is on tradition and quality. On the other hand, Pierre Herme is all about playing with flavour, often combining two very different tastes (like Hazelnut Oil & Green Asparagus) in one macaron. Try them both and let us know what you think! For the ultimate Paris macaron experience, buy a little assorted takeaway box, find a classic Paris viewpoint, and nibble on your sweet treats while soaking up the atmosphere. Laduree - the people to thank for the existence of macarons! Focused on quality, tradition, and their stores are absolutely beautifully decorated. 9 Paris locations, as well as boutiques worldwide! Let’s be honest, one of the biggest reasons we all visit Paris is to indulge in some seriously good food. Of course, you could come to Paris, book into the most expensive, media-buzzed Michelin-starred restaurants, and eat a deliciously gourmet meal and walk away feeling satisfied (and with tighter trousers, no doubt). But we feel there’s something to be said for the type of establishment where menus are still presented on chalkboards by men in waistcoats and ties, iconic French dishes are dished up with little fuss, and the entire dessert tray is brought out to you when the crucial decision-making time comes. We’re talking about the old-school, classically Parisian Brasserie. Originally founded on the idea of classic, traditional food, in the 20th century, Brasseries actually became a symbol of sophisticated, modern life in Paris. Celebrated artists, writers, and creative folk like Ernest Hemingway, Albert Camus, Pablo Picasso, and Jean-Paul Sartre were regular visitors in the evenings, tucking into their hearty French meals (probably with a healthy serving of drinks too). Most have since managed to hang onto their old-world charm while not straying from their original purpose of serving up beautifully simple, classic French fare for a reasonable price. Looking for the classic, super-Parisian dining experience of your dreams? A Brasserie meal is your answer. La Belle Epoque - Three words sum up La Belle Epoque: charming, beautiful, delicious! Les Deux Magots - it might be a firm fixture on the tourist path now, but Saint Germain's Les Deux Magots is where the intellectual elite met, ate, and debated last century and it’s worth a visit just to soak up that history. The food is great too! Bouillon Chartier - the Brasserie that basically started them all! Over 100 years old, and still loved dearly by Parisians today. It kind of goes without saying that Paris runs on wine. After all, it’s an important part of France’s cultural heritage, and there’s no better place to indulge in a glass or two than in the beautiful city of love. The traditional wine bar has always been a popular spot for Parisians to gather and unwind in the evenings. Cosy and generally unassuming, they beckon you in with their warmth, relaxed atmosphere, and promise of quality wine and food. What better way to finish your long days of sightseeing! Prepare to have your falafel-loving world rocked. Amongst all the sweet treats and butter-laden dishes, you might not realise that Paris is also home to some of the best falafel in the world. In the crooked, medieval streets of the super trendy le Marais area, the Jewish quarter of Paris has existed in some form since the 13th century. Today, Rue des Rosiers is its thriving heart, packed with traditional bakeries, delis, and middle eastern delights. Several falafel shops compete along this stretch of road, but our favourite pick is L’As du Fallafel. We visit every time we’re in Paris and are always blown away by their perfectly crisp falafel balls, creamy hummus, and fresh tangy vegetables all bundled up in a pillowy pita. Nom. You’ll spot L’As du Fallafel by the large queue that seems to permanently be planted out the front but don’t be put off by it, we’ve never waited more than 5 minutes! Paris isn’t all Belle Epoque architecture and glittering steel towers; the city is also home to a great number of lush green spaces. 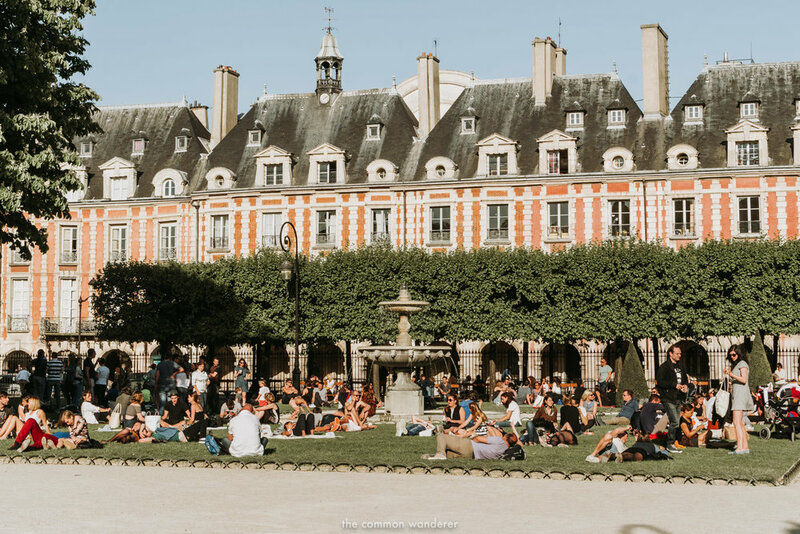 On sunny days, armed with picnic baskets full of gourmet treats, locals flock to these spaces - and Place des Vosges is no exception. Enclosed by grand 17th century red-brick buildings (including Victor Hugo’s house! ), this small but beautifully manicured garden is one of the city’s oldest squares, and a wonderful spot for a picnic. For the ultimate Paris foodie experience, head to the trendy Marais district to pick up your supplies, and enjoy a totally gourmet picnic affair. We recommend a falafel from L’As du Falafel, a charcuterie board from Au Sanglier, baguettes from Au Petit Versailles , macarons from Pierre Herme, and a bottle of wine to wash it all down with from Julien de Savignac. Bon Appetit! The fashion and shopping lovers amongst you will already be super familiar with Galeries Lafayette, considering it's basically France's most famous shopping malls, but there's also a special treat waiting for Paris foodies on the 6th floor! Not only does the rooftop area have epic (free!) views over the Paris skyline there's also an über cool terrace bar (Cube Bar) serving up cocktails and foods to accompany your view of le Tour Eiffel. It's only open during the centres opening hours, so it's best for a daytime tipple on a sunny afternoon! Hours | From Monday to Saturday, 11am to 8pm. Sunday, from 12pm – 6pm. Thanks to Air France’s Travel Guide to Paris, we were able to plan our perfect week in the city. The guide is packed with the perfect mix of well-known Paris spots, and some off-the-beaten-track local tips (like dining at the Belle Epoque Brasserie!). Be sure to check it out when you're planning your next trip to the city of lights. While exploring the gourmet delights of a city by yourself can be awesome, sometimes knowing where to go, what to eat, and and how to do it can be totally overwhelming. This is especially in a city like Paris, which is famed for its cuisine and it's lack of patience for non-French speakers! That's where joining a small group food tour can come in ridiculously useful. Having a local by your side who knows the city (and its eats) like the back of their hand, and can guide you to the best spots to experience authentic French cuisine is absolutely invaluable. Why wait till you’re already on the ground to begin your dream Paris holiday?! Start your trip in style by flying with Air France. From dropping off our luggage easily to enjoying our fresh croissant and coffee on board (with one of the most beautiful airline magazines we’ve ever seen to keep us entertained! ), it couldn’t have been a more perfect start to our week in Paris! Set in a historic 18th century mansion classified as a monument historique, the Hoxton Paris is undoubtedly the most beautiful place we’ve ever stayed (read our review of the hotel here). From the cobblestone and glass entrance way to the plush statement furniture and wooden chevron-patterned floors; it’s contemporary but quaintly charming, nostalgic but uber trendy, and basically, every interior design goal we have for our future home. Our time in Paris was sponsored by Air France and support by Atout France, but as always, all opinions are very much our own!